One special thing about PDA users seems to be that their desire to push the abilities of their little companion to the limit is even stronger than that of the average PC owner. No matter how well designed the built-in applications and how intuitive the user interface, people will always want more: "But sure it can run DOS apps? ", or "I want to attach my XYZ to it. ", or "Why didn't they make this option user selectable?". It may be the curiosity to find out what is behind that locked door, or something you need to get work done "on the road": This page tries to collect information on Brother's GeoBook which is not readily available from other sources, but may be helpful to get you where you want. 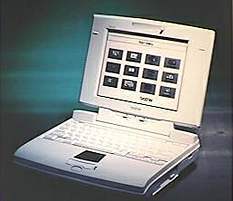 Unless stated otherwise (or unless it is obvious because of the different functions offered by the two devices), all tips also apply to Brother's Super PowerNote SPN-9000GR, which for most practical purposes can be viewed as a somewhat stripped-down GeoBook (no built-in modem, no PC card slot, lower resolution, only half the RAM). And, last but not least, if you have any hints you want to share with other GeoBook users: please let me know, so I can add them to this list.